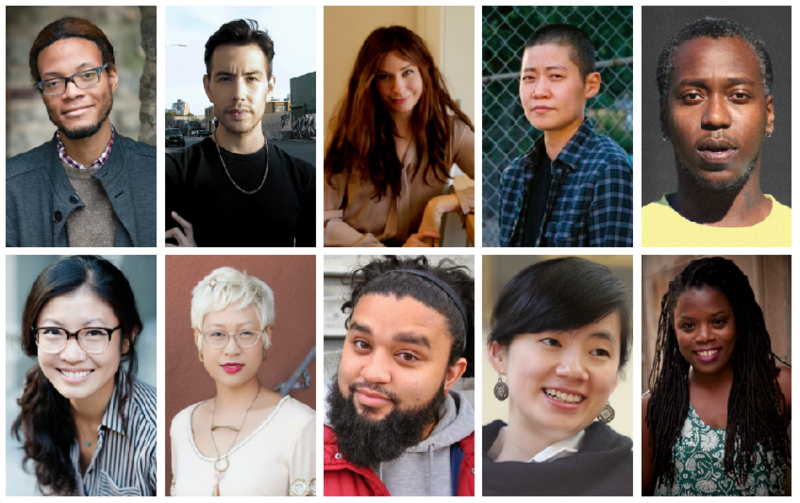 The Whiting Foundation announced the ten recipients of its $50,000 awards at a ceremony tonight in New York City. The annual awards are given to emerging writers of poetry, fiction, nonfiction, and drama. The winners are Rickey Laurentiis and Tommy Pico in poetry; Anne Boyer in poetry and nonfiction; Patty Yumi Cottrell, Brontez Purnell, and Weike Wang in fiction; Esmé Weijun Wang in nonfiction; and Nathan Alan Davis, Hansol Jung, and Antoinette Nwandu in drama. Established in 1985, the Whiting Awards  have given more than $7.5 million to 330 writers  since its inception. Previous winners include poets Tracy K. Smith and Jorie Graham, fiction writers Deborah Eisenberg and Denis Johnson, nonfiction writers Mary Karr and John Jeremiah Sullivan, and playwright Tony Kushner. Photos clockwise from top left: Rickey Laurentiis, Tommy Pico, Anne Boyer, Patty Yumi Cottrell, Brontez Purnell, Antoinette Nwandu, Hansol Jung, Nathan Alan Davis, Esmé Weijun Wang, and Weike Wang.